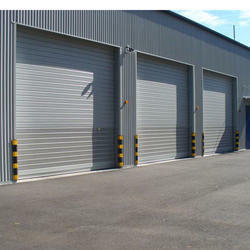 We bring forth for our clients an extensive collection of Auto Rolling Doors. Available in various sizes, deigns and colors, these doors are highly treasured by our clients due to their features like high tensile strength, fine finish, fire resistance, robust construction, light weight and sturdiness. Premium quality raw materials and cutting edge technology are used in the designing of these doors that ensure their durability. By using latest technology, these doors are precisely tested by our experts on various quality parameters. We offer these doors at very reasonable price to the clients. 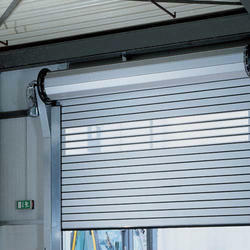 We offer a wide range of Industrial Rolling Shutter doors including galvanized steel lath industrial roller shutters, insulated double-skinned industrial roller shutters in steel or aluminium lath, a range of specialist rolling grilles and security shutters for shop fronts, car parks etc. 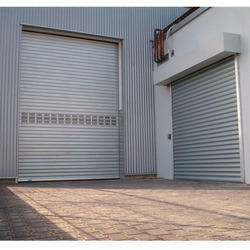 We offer Roller Shutters Motor Repairs, Sectional Door Repairs and Rapid Roll Door Repairs in India. our industrial automatic Shutter have been designed to perfectly blend in any type of Industry and building, from the very modern to the very classical, without affecting either quality or look. Our doors are fabricated from only the highest quality in a variety of slat profiles, finishes, and options to meet any project requirement. Always designed and constructed to your individual specifications, ease of installation, our doors offer the functionality of undisturbed operation and years of durability. Our aluminium roller shutter doors are very popular amongst our customers and are normally used in commercial or residential situations due to their aesthetically pleasing nature. Strong, reliable, and delivering a lightweight protection solution, they are available to fit most apertures, and can be supplied in a finish to suit your needs. This product is available as a bespoke shutter to fit your building, or can be offered as a built in solution for new build properties. 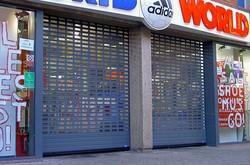 Typically supplied as a solid curtain, we can also offer the option of a punched or perforated shutter. Like most of our shutters, the aluminium shutters can be operated using a single or three-phase motor or can also be supplied in a manual option (depending on size and usage). 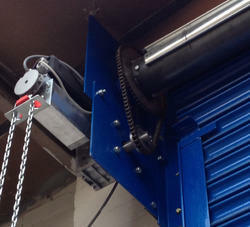 Being of aluminium construction, these roller shutters are much lighter than their steel counterparts. our industrial automatic doors have been designed to perfectly blend in any type of Industry and building, from the very modern to the very classical, without affecting either quality or look. Our doors are fabricated from only the highest quality in a variety of slat profiles, finishes, and options to meet any project requirement. Always designed and constructed to your individual specifications, ease of installation, our doors offer the functionality of undisturbed operation and years of durability. Automatic Rolling Shutter Steel shutters are used to help prevent unauthorized access and vandalism to premises by adding an extra barrier between “outside” and whatever entrances they may be protecting. When open, the shutters provide an almost unobstructed aperture as the shutter and mechanism store above the doorway and out of the way. Furthermore, the doors are tough and have a long life with little maintenance required. They can be supplied up to 10000 mm wide Our aluminium roller shutter doors are very popular amongst our customers and are normally used in commercial or residential situations due to their aesthetically pleasing nature. Strong, reliable, and delivering a lightweight protection solution, they are available to fit most apertures, and can be supplied in a finish to suit your needs. This product is available as a bespoke shutter to fit your building, or can be offered as a built in solution for new build properties. 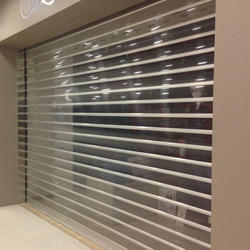 Typically supplied as a solid curtain, we can also offer the option of a punched or perforated shutter. Like most of our shutters, the aluminium shutters can be operated using a single or three-phase motor or can also be supplied in a manual option (depending on size and usage). Being of aluminium construction, these roller shutters are much lighter than their steel counterparts. 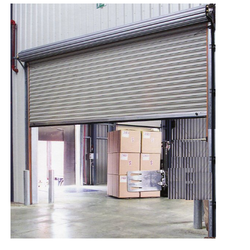 Aluminium Rolling Shutter Transperant Rolling Shutter Some environments call for shutters that combine a high level of security with transparency. Our transparent shutters are used in a wide range of situations including retail premises, banks, museums, exhibitions and galleries, where public access is unrestricted, and high value items must be protected,. Made of horizontal strips of virtually unbreakable polycarbonate, these extremely robust shutters give crystal clear visibility when closed, providing transparency of 83%, and allowing through 92% of daylight. Because it is UV-stabilised, the shutter will not discolour or yellow, and will retain its exceptional clarity for many years. Because they present a more aesthetically pleasing effect than a completely solid shutter, and because they allow through light to help light an area after dark, this type of solution is popular in town centre conservation areas. Punched Rolling Shutter We are able to provide you with a range of punched shutters and grilles so that you may protect your premises and still maintain a high level of visibility. 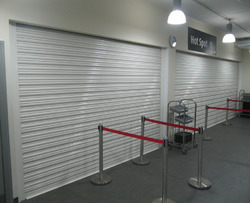 Such a shutter, therefore, typically lends itself to the commercial industry where shop owner’s can close the building up securely and keep their merchandise on show at all times. 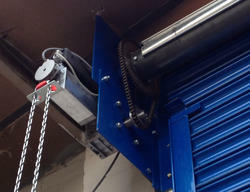 Electrical operation by tubular motor makes the shutter easy to use and avoids any of the Health and Safety issues that are often linked to using manually operated shutters. There are two styles for the lath to be punched – “brickbond” or “in-line”. Brickbond – as the name suggests, the holes are punched in a way that resembles brickwork. “In-line” is where the holes are punched in line. Some environments call for shutters that combine a high level of security with transparency. Our transparent shutters are used in a wide range of situations including retail premises, banks, museums, exhibitions and galleries, where public access is unrestricted, and high value items must be protected,. Made of horizontal strips of virtually unbreakable polycarbonate, these extremely robust shutters give crystal clear visibility when closed, providing transparency of 83%, and allowing through 92% of daylight. Because it is UV-stabilised, the shutter will not discolour or yellow, and will retain its exceptional clarity for many years. Because they present a more aesthetically pleasing effect than a completely solid shutter, and because they allow through light to help light an area after dark, this type of solution is popular in town centre conservation areas. 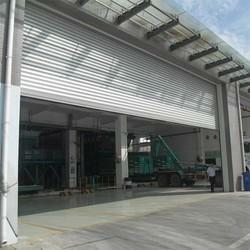 Automatic Rolling Shutter offered comes backed by latest fabrication support as well as latest shutter rolling technology support so as to provide for reliable working performance. Further, these shutters can be developed using double-layer aluminium alloy metal finish with powder coating finish for lasting performance usage. Some of its features include can be provided in specific color choices; roll door could be installed outside and operated manually/electrically; opening ways controlled by motor control; switch/manual mode; remote controlled operations; provides for safe operations and noise free working; suitable for use as commercial door, garage door, industrial door. AC rolling door motor is developed by our company according to the market demands and years of production experience, They are the ideal accessory products in shopping malls, hotels, warehouses and other buildings. 2. It has the advantages of light weight, low noise, convenient to install, safe and reliable performance. 3. Manual operation in case of power failure. Weather resistance:Still keep the physical indicators stability in the range of -40 to 120ºC,Outdoor service life of 20 years, indoor life to 30 years. Environment-friendly: Comply with ROHS, the PC could be recycled. We are instrumental in offering a wide array of Automatic Rolling Shutters to our esteemed patrons.